Trade Show Exhibitors Are a "Buzz" With The New "Viper" 3D Shaped Banner Stands... "They're Different So They Get Noticed!" 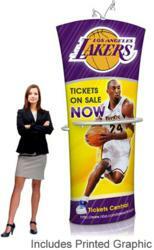 Anything Display announces the tension fabric 3D banner Viper 3D Shaped banner stands. "Rather then the standard square cornered rectangle banner stands, so common at trade shows, these new shaped banners are creating a lot of buzz ... they're different so they get noticed.! ", says Mark Boroska of Anything Display. The turn around time is 5 days which is a bit longer than traditional banners but well worth the wait. Anything Display offering the New Viper 3d Shaped banner stands, now available online at http://www.anythingdisplay.com. The traditional trade show banner is square-corned - rectangular in shape. The Viper is a tension fabric 3D banner that really pops visually. In an industry where change is slow the Viper 3D banner adds a fresh new dimension to in store marketing displays. The Viper comes with the 3D dimension of depth because the tension fabric banner zips like a pillow case around an oval bottom section and stretches and connects to the top section. (see video) The top assembly comes curved - straight or angled. Great for tradeshows and business expos. The 3D banner also includes a shelf and lighting fixture as standard equipment. The price is very competitive with traditional banner stands making them an excellent value. The turn around time is 5 days which is a bit longer than traditional banners but well worth the wait. They're light weight and easy to assemble. It's an excellent value and we are happy to make them available to trade show exhibitors and resellers.